Low cost Reusable Bags have been around for a very long time. Hundreds (if not Thousands) of years. Remember your Mother or Grandmother would have "that favourite" old bag made from Cotton, Hemp or perhaps String. She'd take it everywhere & use it at every possible occasion - it was always at the shops, then it would go to weekend sport, it would also make an appearance at an after-school activity or two. It was indestructible & it's probably still going. Now... bring the clock forward to your world. Do you have that indestructible bag that you use for everything? 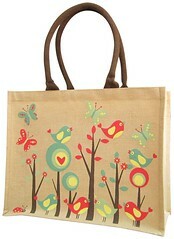 Try one of the selection from Planet Eco Bags, there will be something in there for you.